GIUSEPPE BRUCCIANI was born in 1794. His father was CRISTIFANO BRUCCIANI born circa 1760. His mother was MARIA ALLESSANDRA ROCCHI. Giuseppe was at first married to person unknown. He would have undoubtedly had children and there are many Brucciani descendents from the village of Barga where they lived. 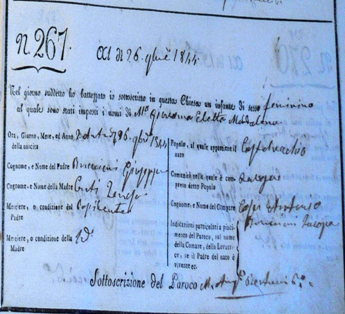 Giuseppe was a figurista and property owning in 1836. 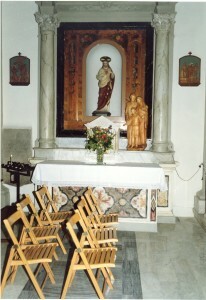 Taken in 2005 the marriage of Giuseppe age 44 and Eletta age 24.
in the Parish of Castelvecchio in the Church of S. Niccoli’ to MARIA TERESA CONTI, daughter of GIULIANO CONTI and Maria Giovanno Giovanelli. 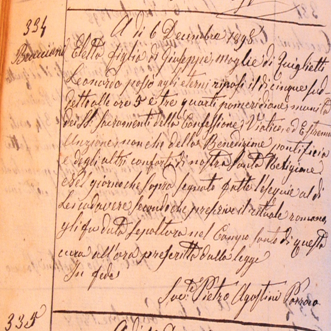 Witnesses were Cristofano Conti, brother of Maria Teresa and Iacopo Bruciatti. [this spelling was given to us by the Italian authorities]. Maria Teresa was described as a peasant at the time of her marriage and she was 20 years younger than her new husband. These are our Italian ancestors. They resided in either Barga or Castelvecchio and their children were all baptised in St. Niccolo’. BRUCCIANI, MARIA ANNA FORTUNATA ALESSANDRA born on 15th April 1842. She was baptised the next day. 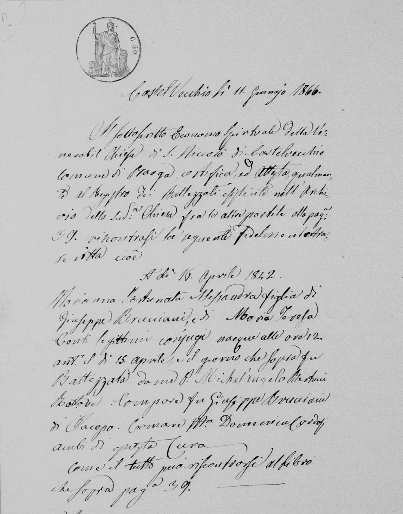 Maria married in Barga on 16th April 1842 to Battezzata Ricci. The Ricci family also had much social interaction between themselves and the Brucciani’s. BRUCCIANI, Amelia Teresa 1845-1929. She married FrancescoDante family from the same village. Her fate was in Rhode Island, USA. BRUCCIANI, FEDELE ALESSIO FERDINANDO born on 21t August 1846. She was baptised the next day. Witness Alessio Lunelli. Fedele remained close with the Quilietti children until her death. BRUCCIANI, MARIA DOMENICA CLEMENTINA ELISABETTA was born on 7th Lugio 1849. She married into the Donati family and they emigrated to Scotland. 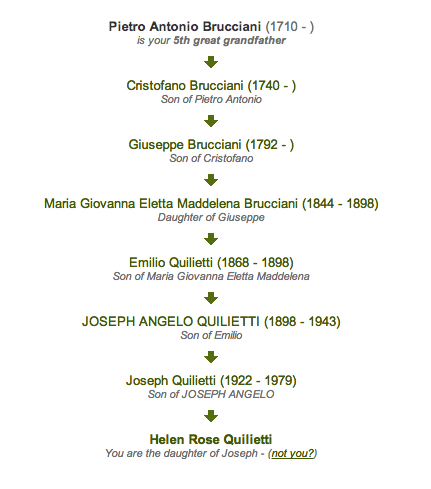 ELETTA BRUCCIANI – our great great grandmother Her Godfather was her uncle Cristofano Conti. 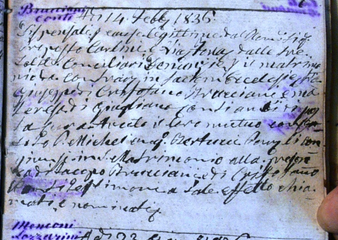 Maria Giovanna Eletta Maddalena Brucciani married Leonardo Quilietti on 1st December in the year 1866 in the Church of St. Nicoli’ in Castelvecchio Pascoli, Barga, Toscana, Italy. She is affectionately known to us as Eletta Quilietti. She is our Italian mama, our great ancestor, and her family roots dig deep in the village right back through the centuries. Eletta was born on 26th November 1844 in Barga and she died on 5th October 1898. Her marriage to Leonardo was fruitful and her children spread the Quilietti name throughout the world. THE BRUCCIANI family from Barga/Castelvecchio. The family moved from their land in great numbers after the unification in 1861. Scotland saw many of the family settle here some in Ayr and Dumfries and others in the Glasgow area. They were figurini by trade but settled very well thank you into the new ice cream and restaurant businesses which were thriving here in Scotland. Eletta’s sister Maria settled in Edinburgh with her husband Pietro Donati and their children. Other branches of the Donati family also settled in Ayr and Glasgow. They were well spread out throughout Scotland but we have the proof that they still kept in touch. Marriages saw witnesses who were cousins, uncles and aunts who had travelled in some cases for many miles to attend. The branches of the family who settled in Ayr were from Barga and described as Confectioners in the year 1891. 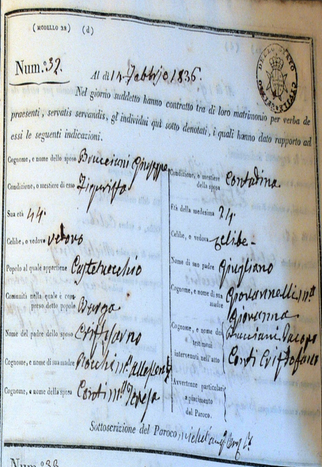 Pietro was the head of this family and was born circa 1865. We believe he was a nephew of our own Eletta, one of her brother’s sons. Louis Brattisani was also from Barga and he settled in Annan in Dumfries. Born in the year 1868 we believe him also be be a nephew of Eletta. Then there was Giovanni Brucciani who was born in 1850 in Barga. He was a figure maker by trade and the 1891 census sees him sharing with other figurini with surnames Nardini and Caproni in the Govan area of Glasgow. Glasgow also became home to Antonio Brucciani and his family and they shared a flat in 1891 at 327 Crowne Street in the city. Antonio was born in the year 1854. His ‘servants’ were Giovanni Gonella, Celestino Biagiotti, Sabato Moscardini and Giuseppe Ghiloine who all worked with Antonio in his thriving confectioners business. The Gonella family were well intertwined with the Brucciani and Conti families from their home in Barga. They also went on to own one of Glasgow’s foremost cafe’s. Ciao – I am doing research into my family. My mother is Josephine brucciani, her father was luigi brucciani and mother annita moscardini. Our families join up in the previous generation, and I wonder if you have any info about how the brucci’s got to the uk?